Banaras has always been associated with philosophy and wisdom. In Banaras we find many places where a temple once stood. 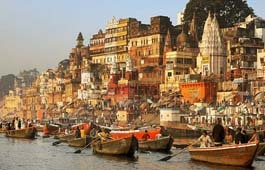 Since Banaras is a pilgrimage centre, revered and honored throughout India. The museum has a fine collection of ancient Indian terracottas, some found in excavations in and around Varanasi itself. Most of them date back to the Mauryan, Sunga and Gupta periods; a few belong to prehistoric times, unearthed at the Indus Valley sites. Indus Valley terracottas have a special charm; they are often tiny - only two or three centimeters (an inch) in height. Other larger ones belong to the Gupta period. There is an entire gallery of Indian terracottas on the first floor and some objects are also displayed on the ground floor, in glass cabinets. On the ground floor, one entire gallery is devoted to stone sculptures, a collection of masterpieces of different styles and from various periods of history. Just past the entrance to the gallery, to your right, the wall space has been divided into niches, each containing a sample collection of items illustrating one style of Indian sculpture. The earliest ones are Buddhist. There are a few relief sculpture sculptures in red sandstone from Bharhut, dating back to the second century BC. One is a Yakshi on an Elephant Mount, a tall figure carved onto a vertical railing post. The yakshi's height gives an indication of the massive proportions of the railing and the stupas, that no longer exist. The Timingila Jataka (Bharhut, second, century BC) is depicted here in stone. there is one beautiful and rare sculpture from Amravati of the first century entitled, Buddha Taming the Mad Elephant, Nalagiri, in which the figure of the Buddha is shown standing straight and fearless on one side, while the elephant that was running riot stumbles to the ground to render obeisance to the Buddha, who miraculously quietens his range. One, entitled Toilet Bearer, is from Mathura. It depicts a woman carrying a jug of exquisite proportions, with elaborate carving, in one hand; in her other hand she carries a wicker basket , with a conical cover, overflowing with trinkets. The figure of the woman is delicately carved, adorned with jewellery, with belts of many loops and chains worn round her waist to support the lower garment that falls gracefully, clinging to her lovely legs. The second Kushana sculpture is from the first century (Mathure). It is a rather mischievous one of a Lady Riding a Griffon, in which the woman, with an elaborate hairstyle, sits ona griffon that grimaces in an effort to free himself from the control of the woman who pulls firmly on the bit in his beak. Sundari is shown seated, with an attendant combing her hair. It is a masterpiece, almost theatrical in detail, and important because it shows how Indian and foreign influences were synthesised in the Gandhara School. There are some damaged, sculptured heads of the Buddha that are almost skull-like, depicting a stage in Buddha's meditation during which he practiced severe penance in search of the path to truth and enlightenment. There are many sculptures of Surya, the Sun God, whom art historians believe was a deity adopted from foreign lands, for he is the only Hindu god shown wearing boots in sculptures. One such sculpture of Surya, belonging to the Gupta period (sixth century), has a distinctly Persian or Zoroastrain appetence. Surya is shown standing, his tunic held in place by an ornate metal belt with a very interesting buckle, and his hair is in ringlets and layered curls. Hara Gauri (Chandella period, 11th century, from the Banaras region); Brahma (11 century, Banaras), the powerful goddess slaying the demon bull Mahisha, whom she has caught by his hair, her multiple arms full of energy. Among the Shiva sculpture on display, the one entitled Ravana Nugraha Murti (tenth century) is the most poetic. Another interesting piece depicts the Marriage of Shiva and Paravti (Prathihara school, tenth century, Etah, Uttar Pradesh). This sculpture, the stances are a trifle, captures the scene of the marriage ceremony that commemorates the great love of two major deities, the perfect male and female ideals. There is a Gupta sculpture of the fifth century, from the Varanasi region, of the young chief of Shiva's army sitting astride a peacock whose glorious tail spreads out like a canopy behind him. The Dancing Ganesh (Prathihara school, ninth century, Kannauj) is poised for movement, his foot ready for action. Alasa Kanya is a languorous woman, yearning with desire. The main attraction at this excellent Archaeological Museum is the superb capital from the Ashokan pillar. It has the Ashokan symbol of four back-to-back lions which has been adopted as the state symbol of modern India. Other finds from the site include many figures and sculptures from the various periods of Saranath - Mauryan, Kushana, Gupta and later. Among them is the earliest Buddha image found at Sarnath, Buddha figures in various positions dating back to the 5th and 6th centuries, and many images of Hindu gods such as Saraswati, Ganesh and Vishnu from the 9th to 12th centuries. The museum is open from 10.00 a.m. to 5.00 p.m. daily, closed on Fridays. The residence of the Maharajali of Varanasi, Ramnagar Fort, looks down upon the Ganges not far south of the Asi Ghat. The best views of the fortifications - especially impressive in late afternoon - are to be had from the other side of the river, which is reached by a road heading south from the BHU area and over a rickety pontoon bridge. During the monsoon the bridge is dismaniled and replaced by a ferry, still preferable to the long main road that crosses the main Malaviya bridge in the north before heading down the eastern bank of the river. Inside, the fort bears testimony to the wealth of the Maharajah and his continuing influence. A dusty and poorly kept museum (daily 9am-noon & 2-Spin; Rs3) provides glimpses of a decadent past: horse-drawn carriages, old motor cars, palanquins, gilded and ornate silver howdahs (elephant seats), hookaha, costumes and old silk in a sorry state are all part of the collection, along with an armoury, a collection of minute ivory carvings, an astronomical clock and hunting trophies. Some visitors have reported having tea with the affable Maliarajah after chance encounters. Across the courtyard, a section is devoted to the Ram Ula procession and festivities, had during Dussehra (Oct). Varanasi is renowned for its Rain Lila, during which episodes from the Ramayana are re-enacted throughout the city and the Maharajali sponsors three weeks of elaborate celebrations. 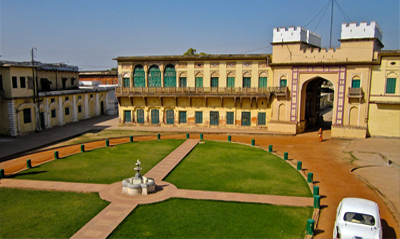 A 17th - century fort, Ram Nagar is the home of the Maharaja of Banaras,Personal collection of the Royal Family housed in the Ramnagar Museum The museum’s collection includes of interesting vintage silver and brocade palanquins, howdahs, a replica of the royal bed and an armoury of swords and guns. (open 10 AM. to 5 PM) Ramnagar is also very famous for its unique Ram Lila. Across the Ganga lies the Ramnagar fort, ancestral home of the Maharajas of Banaras. 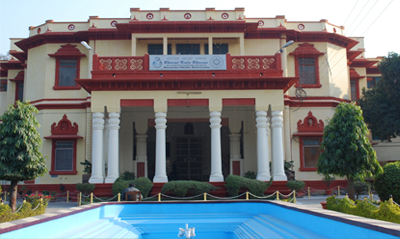 The museum consequently displays weapons, manuscripts, palanquins and the decorative arts. On view is an astronomical clock, textiles and paintings. Two outstanding objects are a textile woven with ivory and a pictorial depiction of Dussehra celebrations on the river which involves a colourful procession of boats. India is well known for its religions, unique art & culture, a glorious past and blend of tradition, crowded with temples and many more worth seeing places. A Golden Triangle Tour package will give you the golden opportunity to experience this spectacular and incredible journey of north India. 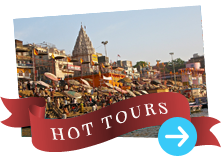 Golden TriangleVaranasi tour presents an amalgamation of various art and cultures. Copyright © Hotel in Varanasi . All rights reserved.